Tired of struggling alone to win finance interviews and land the job offers you desire and deserve? Think you’re ready to sign up? …then you need to at least explore a private coaching or consulting relationship with a finance interview expert. All super-successful finance industry professionals who have made it to the top have one thing in common: a network of great insider contacts and people they can confide in. They consistently network with people who have the knowledge, contacts, and connections to help them get ahead. And when they need some serious help, they’re not too proud to seek out genuine experts who can add a dose of insight and re-alignment, in order to reach their goals more quickly. It’s like going to a specialist physician for a “second opinion” after you’ve seen your family doctor – only this will get you results a lot faster, and with a lot less pain! Ten years ago, before I successfully broke into the finance industry, I was stuck in limbo. And made it into 7 final rounds, winning 2 full-time offers. See, plenty of friends who had worse grades and less experience than me had a MUCH higher success rate. Some people simply applied to the exact jobs they wanted and got them – often with success rates of close to 100%. But I was sitting there “fighting over the scraps” and working way too hard for the results I was getting. Oh, and here’s the punch line: this was back when the market was good. If I were to follow this same strategy today, I wouldn’t have made it to any final rounds. In the end, things worked out OK: I worked at banks like JP Morgan and Credit Suisse in roles ranging from investment banking to sales to private banking. But I made things far more difficult on myself than I had to. See, there’s a big difference between the way the “average person” goes about looking for a job, and the way a smart person does it. The smart person isn’t shy about getting help from mentors, coaches, and those who have been through the entire process before. Since breaking into the industry, I’ve interviewed hundreds of candidates – and spoken with even more students and professionals worldwide who want to break in. You don’t know how to pitch yourself effectively, tell your story, and market yourself – or how to set yourself apart from everyone else going for the same jobs. You don’t know how to network effectively and build relationships – without making networking your full-time job, or feeling like you’re “stalking” your contacts. You’re not answering interview questions effectively, and you’re not quite sure what they want to hear… or how to position yourself as the best person for the job. 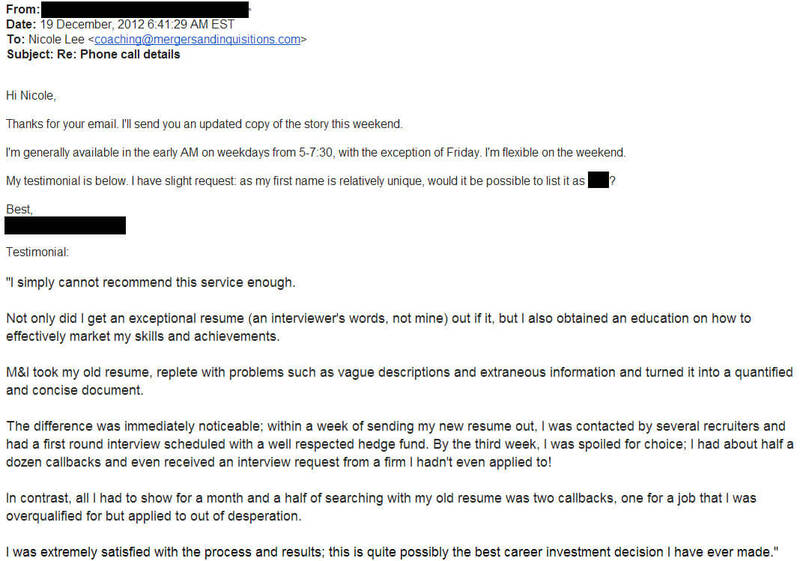 Don’t get me wrong: I found dozens of “career coaches” and resume writing services – but nothing that focused specifically onfinance and investment banking. Let’s be honest: generic career coaches are useless in this industry because “the standard advice” just doesn’t apply. So you can’t bother with the generic coaching services – unless you also want “generic” results, AKA no job offers. If you want to break into finance, you must master 5 critical skills. It’s not just “knowing” what these skills are – anyone could “learn” about these skills just by reading the hundreds of articles and case studies on this site. How to build industry contacts and network your way past gatekeepers and into the boardroom – even if you don’t see yourself as a “natural networker”. These are specialized, learn-able skills for building the key connections you need. How to position yourself in information sessions and informational interviews in order to stand out. There is an art and a science behind presenting your background as unique and desirable to an employer, and you must strike a delicate balance between being “interesting” but also appearing capable and hungry for the job. How to market yourself so that overburdened investment bankers take the time to read your e-mails and take your calls – even when Crazy Client A and Crazy Client B keep calling them repeatedly at 2 AM to request changes to the font size on page 197 of the Board presentation. How to tell your “story”, ace your interviews, and start your career on your own terms. If you don’t get your “story” right, no interview will ever go on past the 5-minute mark… and all those networking efforts will amount to nothing. How to present to interviewers if you are shy, or if English is not your first language. If you don’t get feedback on your “pitch” and “presentation,” especially if English is not your first language… all those rehearsals will amount to nothing. Mastery of these 5 foundational skills lies at the core of our coaching programs. There are many ways you could learn these skills… or try to learn these skills… and there are lots of “career coaching services” online. They’re not specialized, and they’re not focused on the finance industry. You’ve tried those alternatives… or you’re not getting the traction and results you want, and you’re not sure why… or you just want to cut to the chase and fast-track the whole process. If that’s you, then I invite you to consider applying for our investment banking coaching services. Our coaches are all investment banking industry veterans, and are now FOCUSED on coaching full-time.This means you’re not dealing with high school career counselors that are completely clueless… you’re working with real people with industry experience across investment banking, private banking, capital markets, sales & trading, and more.And at the same time, you’re also NOT working with professionals who are working 80+ hours per week and simply “forget” about you when it’s no longer convenient because coaching is just a “side project” for them. You get the best of both worlds, because that’s what gets YOU the best results. Step-by-step finance interview methodology:We have a proven, step-by-step methodology for breaking into investment banking and the finance industry that has worked for hundreds who were in the exact position you are in right now. This is what you’ll get in our “Action Plan” document if you sign up for one of the package deals we offer.Breaking into the industry is not some mystical art with voodoo and magical powers required – it’s all about following a proven process rather than flailing around without any direction. And you don’t need top grades from Harvard or Oxbridge or multiple internships at Goldman Sachs to pull it off – it’s mostly about how badly you want to succeed. Straight talk and tough advice you need to hear:If we were doctors, we’d have horrible “bedside manners” – because we tell it like it isand are extremely blunt with you, especially when you won’t like what we have to say.Many career coaches are all too eager to pat you on the back and tell you how well you’re doing… but fail miserably when it comes to confronting you and challenging you to push yourself higher.In other words, we act the same way bankers interviewing you will act: we ask the tough questions and give you honest assessments about how well you’re doing and what you can or can’t do. You’re signing up to get results, not to add another Facebook buddy. Hundreds of satisfied clients:Just read some of the client testimonials on this page, as well as the detailed testimonials and stories elsewhere on this website and our sister site, Breaking Into Wall Street. We have the most extensive record of results with clients in the finance industry of anyone, online or offline. Potential ROI of 100-200x or more:While our service isn’t “cheap,” it does offer extraordinary value to the right applicant. Entry-level jobs in finance pay at least $100,000+ USD, and from there the pay quickly rises to $200,000 or more once you’ve been on the job several years.So your investment in our services will pay off many, many times over – the ROI over just 1 or 2 years might be anywhere from 100x to 200x, and it only goes up over time once you look at your earnings over the next 5-10 years after you’ve broken into the industry. How do I “spin” my non-finance experience to make it sound relevant for a finance role? I have great grades and a top school on my resume or CV… why am I not getting interviews (or job offers)? My grades aren’t all that great… but I have other strengths and think I would be a good fit for the industry. How can I put my best foot forward? Which roles would fit my interests, desired lifestyle, goals, and aspirations? How do I start networking? What do I say to “break the ice”? Should I focus on certain roles to increase my chances of breaking in? How can I best position myself to move to a PE/HF shop? I have a gap of a few months/years on my resume – how can I explain that to interviewers? How do I go about networking if I don’t want my colleagues to know I’m looking for a new job? Why did I get dinged by the dream firm I just interviewed with? What went wrong and how can I do better next time? How can I network aggressively without seeming like a stalker? How can I make a major career change into a finance or business role if I have no previous experience? Why do people with worse educational backgrounds and less work experience than me keep landing more interviews and offers? And how can I compete more effectively? How can I stand out and become more than just another face in the crowd? What can I say to get bankers to know, like, and trust me and then hire me? It’s very, very unlikely you’ll have a question we haven’t heard and successfully answered before. 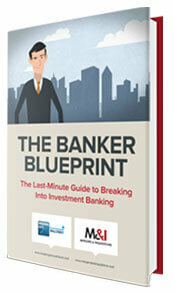 You’re tapping into a vast reservoir of finance interview knowledge when you use our service. 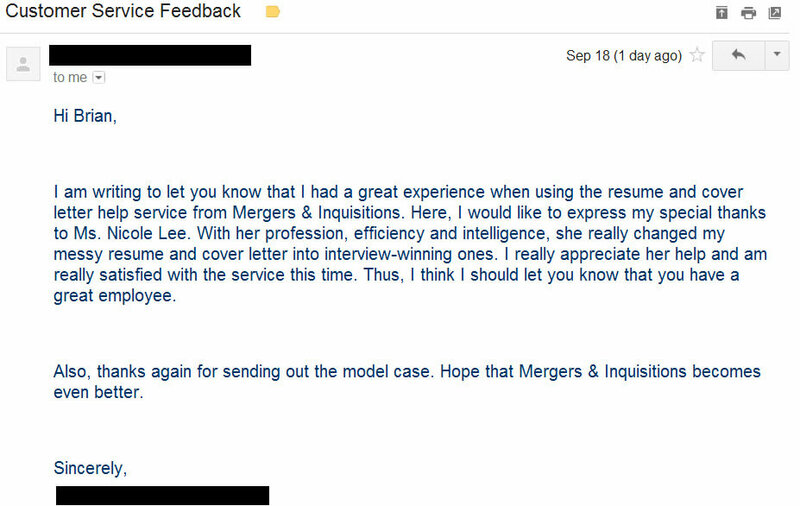 Note that our clients typically sign up for package deals, so these comments refer to both our coaching and resume / cover letter editing services. As you can see from the examples above, when there’s a fit between us and our clients, the results can be extraordinary. With all that said, this coaching service is NOT right for everyone. The truth is only a relatively small and exclusive group of candidates is a fit for our services. Client fit is very important to us, and we only want to work with people we know we can help. While we promise to give you our full expertise and attention, we cannot guarantee your success, because there are so many factors beyond our control. However, we CAN help you to put your very best foot forward and achieve your goals much faster than you otherwise would.If you have a 2.0 GPA from an unknown school with 0 internships and expect us to magically get you an offer at Goldman Sachs Investment Banking in New York or London, then keep dreaming. In this situation, we would actually recommend NOT signing up at all because our services would not be terribly helpful for you. Career changers who want to break into finance at the MBA level or post-MBA levelIf you are NOT in one of those categories above, please do NOT sign up for these services.Yes, there is a chance that our strategies might still help you… so if you fit slightly outside the categories above, you could contact us first to get our thoughts before you commit to anything.But in most cases, these services will be FAR more helpful if you’re in one of those 3 categories above.And please, whatever you do, do NOT sign up if you’re currently a 1st or 2nd year university student with no previous internships or work experience, because these services will not help you at all. There are NO REFUNDS and NO DISCOUNTS for this service. Here’s where we’re coming from: we are investing a significant amount of our own personal time into working with you – often days or weeks. Our time can never be replaced. We’ll play full on, and we expect you to as well, working “without a net”, just like in the real world.But please be assured that if we don’t feel there is a fit, we will immediately refund what you’ve paid. However, once we do accept your payment and we both decide to proceed, there will be no refunds granted. Only apply for this program if investing in it would NOT be a financial burden for you and your family. We do not want you taking on credit card debt or any other type of debt to pay for this – and if we find out that you’ve done that, you will be refunded immediately and we’ll cancel the services. We edit resumes and cover letters based on our official templates (ExampleResume Templates and Cover Letter Template) and the advice given on the site, and we only provide one-page resumes and cover letters. Please review the templatesbefore you sign up to see if these templates suit your needs or not. If they do not suit your needs, do NOT sign up for these services. Yes, of course we’ll work extensively with you to customize these documents to reflect your own experiences – but these templates represent the starting point for everything else we do. We ask that you be respectful and give us 10 hours of notice when cancelling any coaching session with us. Please note that the coaching session will still be counted if there is a no show or less than 10 hours of notice was given before the session commences. Again, we invest a lot of time into working with you, and the relationship has to work both ways for it to be mutually beneficial. Including this list of 8 important points to keep in mind before signing up. NOTE: This email Q&A expires in 30 days after your initial sign-up. You MUST ask your questions within that time frame, because personalized Q&A expires at the end of this period. If you want to commence your Q&A later than your sign-up date, please let us know your reasons and your time frame in advance, and we may make exceptions depending on your case. Please note that we will not be able to answer individual Q&As after the 30-day period. How much is it costing you to delay starting your career by another week, another month, or another year? Even if you consider an entry-level analyst role that pays $100,000 per year… it’s costing you $2,000 per week not to be in the role you want. Winning a lucrative investment banking job could mean that you pay off your entire investment in the first week or first month (and still have more than enough to celebrate your new career move with family and friends!). Professional job placement agencies will charge you thousands of dollars upfront and provide you with nothing more than tired, old regurgitated training materials that are completely useless. And finance-focused headhunters won’t even speak with you unless you have the exact experience they’re looking for. For personalized, industry-specific coaching and support, you will not find better value anywhere else. Yes, there are some standalone services for JUST resume editing or JUST coaching that may save you a few bucks. If you want help from professionals with a track record – who are now doing this as their full-time jobs as opposed to “side projects whenever there’s some downtime in their 80 hour per week job” – then this is the best service around. But if what you’ve tried so far has not gotten you the results you want at the speed you want them, then we can help you gain traction and get a better outcome for yourself right away. Choose your preferred option above, and we’ll be in touch to find out more about your situation and advise you on the next steps. And if you decide that it’s not for you before we begin, or we decide that we can’t coach you effectively, we’ll refund every cent you paid. We look forward to potentially working with you! P.S. To recap: we believe this is the most comprehensive, IB and finance-specific coaching service available anywhere, online or offline. We have hundreds of testimonials on file from finance professionals whom we’ve helped. And while this isn’t right for everyone, we DO pledge to only take you on as a client if we firmly believe we can add value. We look forward to hearing from you. P.P.S. Still have questions? Feel free to contact me and I will be happy to respond to any specific concerns, questions, or comments you have.